The mission of the Street Department is to provide a well-maintained and safe transportation system for the City of Mena. Major functions of the Street Department include: street repairs, minor street resurfacing, pot hole patching, street cut repairs, overall street maintenance, and mowing public rights-of-ways, as well as, removal and pruning of trees in rights-of-ways that may obstruct the line of sight for traffic and possibly cause an accident. During storm periods, the Street Department works to ensure the safest possible travel conditions are maintained throughout the City. In addition, the Department also manages the storm drainage system for the City to safeguard against property loss and accidents; installing drain tiles, cleaning ditches, and performing other related repairs and structural improvements necessary to provide needed drainage capacity and reduce flooding incidents. 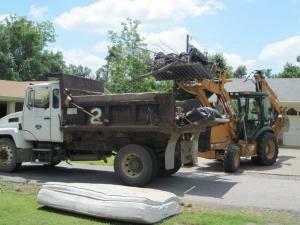 The City of Mena conducts two citywide clean-ups each year. This is a free service which offers residents an opportunity to dispose of any unwanted items. Spring Clean-Up – begins the first Tuesday in May each year and all household articles (such as appliances and furniture) are picked up. The only exceptions are construction debris, tires, and batteries. Fall Clean-Up – begins late October each year and includes only yard waste items such as limbs and leaves.